Last week David Browder posted a fascinating video of Penn (of Penn and Teller fame) sharing about a positive experience of being proselytized. I found it tremendously inspiring and very appropriate for the (church) season of Epiphany. Since this season is all about God making himself known to the world as its Savior, one of its major themes is “evangelism,” or sharing the faith with other people. God working through human beings to make himself known to the world. Sadly, the American Evangelical (a broad term, I know) idea of evangelism has become completely different from the picture we are given in the New Testament. It is primarily subjective and rooted in our experience as opposed to Biblical evangelism which is objective and rooted in the history. Let’s face it – the word “evangelism” is taboo in our society. Besides the fact that Jack Chic and his cartoons have made it awkward (see below), I would argue that evangelism is taboo because we make it all about us and what we are doing. How often have you heard a testimony about how Jesus has made so-and-so a better person? I remember when I was in college I went on a mission trip to San Diego State University, where I was asked to speak to a crowd of antagonistic twenty-somethings who had begun to mob my little church group. I didn’t know what to say so the mission leader said, “Just tell them your personal testimony, they can’t argue with your story. Tell them who you used to be before Jesus, as opposed to who you are now.” So I shared my story with the crowd, how I was a bad person before, but then Jesus came into my life and made me a better person, that since then, things in my life had only gotten better. (“Can’t get no worse” Paul McCartney). Much to my surprise, no one bought it. They could and did argue with my story; it was my word against their word. What they heard me saying was that I was better than they were as a result of Jesus, and naturally, they were enraged. It is true Jesus has come into some of our lives and radically transformed us. Many of us have shared such stories and meant every word. Nevertheless, testimonies such as these do tend to make evangelism overly subjective. 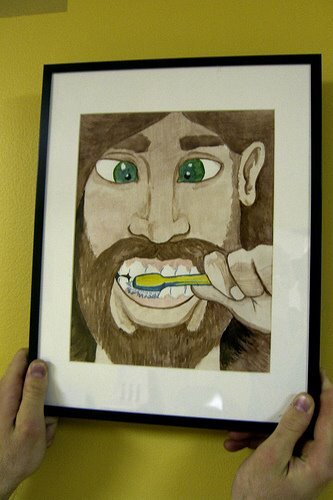 Jesus becomes no different than some sort of over-the-counter medication or toothpaste. “I had yellow teeth, but then Jesus came into my life and now my smile sparkles.” As such, they testify more to us than to Jesus, about who we were versus who we are now and how great life will be in the future (a.k.a. A Theology of Glory). When evangelism falls into the subjective it will always become an awkward thing. It can even call into question the power of the Gospel. For example, what if you are the person reading this blog and you “accepted” Jesus into your heart, but nothing feels different, life still stinks… Does the Gospel still hold true? No, it does not! Subjectivity makes things only as reliable as our experiences and feelings. Hence, evangelism becomes taboo, at odds and in competition with other products and their “results”. As I often hear people say, “just because Jesus works for you doesn’t mean that it will work for me”, i.e. “Nazareth, what good could come out of Nazareth.” And if evangelism is only about our changed lives, then indeed their critique may be right! What then does real, biblical evangelism look like? The word “evangelism” has the same Greek root as the word Gospel. It is about something outside of you, namely, the Gospel, the most important message in the world: that Jesus Christ died for our sins and that on the third day God raised him from the dead, so that we might become children of God, no longer subject to his just wrath and condemnation. Real evangelism points to Jesus and his work. A few examples include: Phillip to Nathaniel in John 1:45, “We have found him of whom Moses in the Law and also the prophets wrote.” Or in John 4:29, when instead of talking about what an awesome person she is, the woman at the well proclaims, “Come, see a man who told me all that I ever did. Can this be the Christ?” I could go on. So, like the guy who proselytized Penn, we don’t have to worry about the relative worth of our subjective experiences. Rather we witness to the love of God found only in the cross which promises and proclaims redemption despite our feelings or how we are living, which is always far from the perfection that is demanded in God’s Law. In other words, real evangelism should always be objective. What a relief! Can’t stop thinking about this. To my way of thinking the subjective, testimonial-based approach to evangelism is entirely based upon the (what I would call) worldy notion of infusion, whereas the gospel and evangelism entirely reflect an approach that is born out of imputation. The life to look at is not mine, but Christ’s, and that’s the point of the whole endeavor, thank God! JZ, your spot on and that is why I love that Cranach picture of Luther preaching. I love how Luther points out of the pulpit to the crucified Christ alone.